Hello ... Hello ... my old friends ... It's great to see you once again! 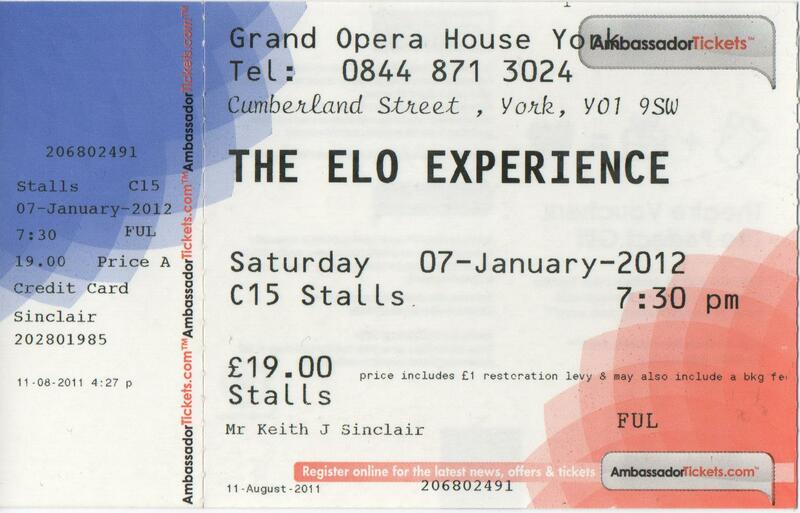 As I travelled solo the 130 miles up to York yesterday afternoon to witness another concert of The ELO Experience - and to meet up with a few fellow ELO fans - I wondered what 2012 would bring in terms of how Andy Louis and the band would tweak their set for the New Year. And I need not have wondered folks! 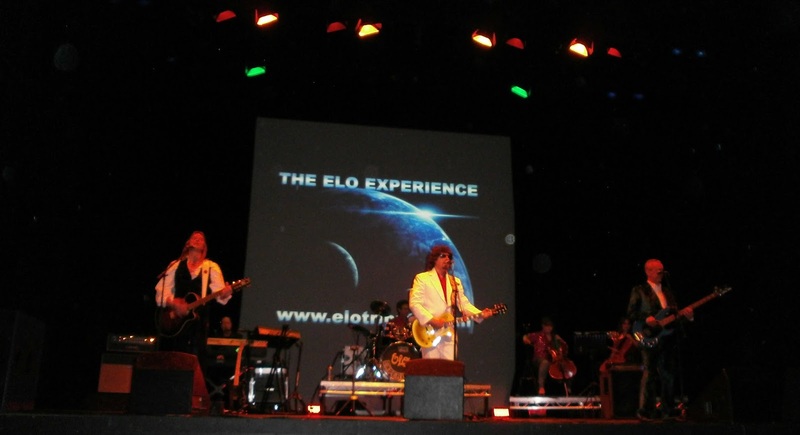 Last night, The ELO Experience produced not only another superb and professional show at the fantastic Grand Opera House, they took their act up to the next level. Again backed by two marvellous cellists, the band poured through those well-trodden ELO hits whilst paying a great deal of attention to the full scope of those classic songs composed and "Produced by Jeff Lynne" all those years ago. Besides the new bespoke projector and the backdrop of ELO imagery, it would be pointless to cover old ground and discuss the impressive set list. What is of more interest are the changes to their set since my last gig in September. The band have truly pulled out a masterstroke folks! 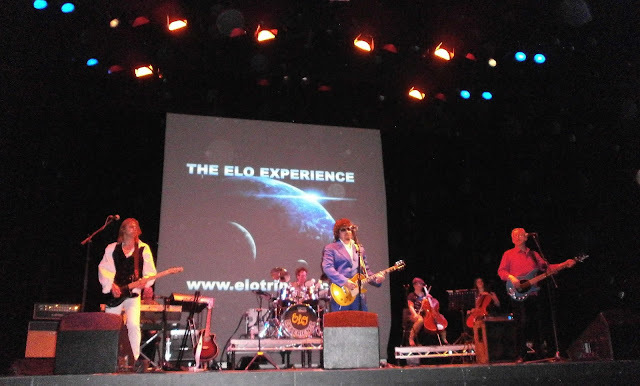 In place of "Don't Walk Away" and "Calling America" the band are now seamlessly performing the first half of "Concerto For A Rainy Day" together in "Standin' In The Rain" and "Big Wheels" and it was a triumphant tribute to that classic ELO sound. But the real clincher is their superb rendition of "Latitude 88 North" from the OOTB 30th anniversary edition. If I am moved by the music; lyrics and orchestration of "Big Wheels" on the OOTB album, then to hear it live is simply beyond mere words. But to also hear "Latitude 88 North" live really was the icing on the cake, proverbially speaking. The encore [final] song of the evening "Mr. Blue Sky" was fittingly dedicated to the late, great Kelly Groucutt to close out a truly superb concert. This band have truly matured both in terms of their production and presentation and now only really lack an eclectic violinist! 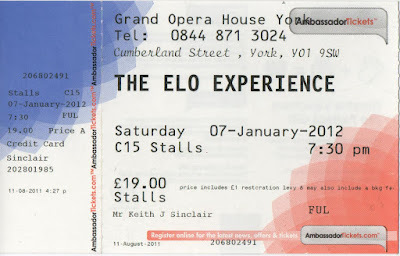 It was an amazing concert and brought life to music that I had only heard on LPs/CDs. As always the ELO Experience perform the music of Jeff Lynne superbly. The attention to detail is one of the assets of the group. If they appear at a venue near you, go along a hear the sounds re-created by these fine musicians. The 2012 tour has just started and promises to be more spectacular than ever. Might you be coming back to Edinburh this year?